"HTML5 is more capable than most developers realise"
What's open about the market? One of the continuing criticisms of Apple's iPhone is the inability to load apps that haven't been through the App Store's opaque approval process - unless you're prepared to jailbreak. For many developers, Android presents a more open environment, with fewer potential barriers to entry. However, stories of the riches from Apple's platform make it a tempting proposition anyway. It's often forgotten that the iPhone supports web apps, which face none of the restrictions imposed by the App Store. However, discoverability can be a problem for applications from small developers if they're not presented front and centre. 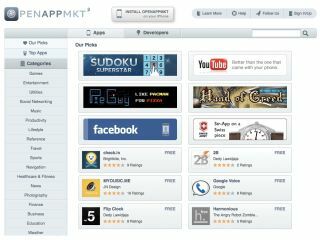 OpenAppMkt is an app store that aims to bring fully functional apps, built using open web standards, to the iPhone - with no hassle over approval. Though entirely web-based, it acts much like the App Store. Go to it via a desktop browser, and it appears similar to the iTunes-bases App Store. Access it on your iPhone, however, and it's a simpler, optimised version. Using the built-in option in Safari, you can add it to your Home screen and access it as easily as Apple's own store. You can then browse through familiar categories, including utilities, navigation, games, entertainment and many others. Tap the price button to buy (most are free, but those that aren't can be purchased with debit or credit cards). Follow the simple instructions to install the apps and then access them from the Home screen as if you'd bought them from the App Store - no Apple approval required. "The mobile web has been largely ignored by developers in favour of native platforms, like Apple and Android, due to the ability to reach users on those native app stores," Teck Chia, CEO of OpenAppMkt, told TechRadar. "This is despite the fact that, with HTML5, the open web is a better platform for many categories of apps." Though the iPhone has supported web apps since before the creation of the App Store, they've failed to gain the attention of the wider, mainstream audience in the same way the native apps have. With not only all the attention, but a lot of the money, going on native apps, web apps needed something to push them to the forefront. "For most categories of apps, we think the web platform offers clear advantages over native platforms. Most developers already know this on the desktop," Chia explains. "We've all seen apps transition from native to the web before on the desktop. I think the same thing is going to happen on mobile. "The motivation [for OpenAppMkt] was to solve the two missing pieces of the mobile web, which are distribution and monetisation." In fact, the OpenAppMkt actually offers a more generous amount to developers from paid apps than Apple: 80 per cent goes to the creator, rather than the App Store's 70 per cent. However, that extra cut for the developer isn't just an attempt to get one over on Apple - the open nature of the OpenAppMkt means it doesn't need to bring in as much money to be sustainable. "Our intent was more about giving back to the developer as much as possible, rather than undercutting Apple. We can cover our costs with 20 per cent because we didn't need to hire people to vet and approve each app that gets submitted," Chia told us. Next Page What's open about the market?